Silent Hunter® 4: Wolves of the Pacific: Silent Hunter, the industry-leading naval warfare simulation franchise for over a decade, returns to its roots with next-generation graphical realism, immersive gameplay, innovative crew evolution and more action than ever before. 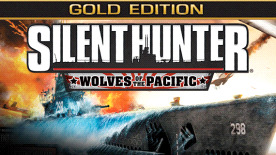 Silent Hunter® 4: Wolves of the Pacific - U-Boat-Missions: Experience the thrill of the hunt! Prowl the waters as the captain of a German submarine in a never-before-seen theatre of operations- the Indian Ocean. Take part in the war against British supply lines off the coast of North Africa and support the Japanese war against the U.S. Navy. Hollywood Blockbuster experience: Lifelike graphics and spectacular audio/visual effects offer an incredibly immersive gaming experience. Witness the historical accuracy and the amazing attention to detail from the breathtaking Pacific settings to the more than 75 authentic-looking war machines such as the U.S. Gato class submarine, the Japanese battleship Yamato and the H6K flying boat. Large Scale Naval Engagements: Epic naval engagements can be witnessed by players either firsthand or via radio messages and orders from high command. Innovative crew evolution: Earn upgrades and experience to guide the evolution path of crew members, making your men the most effective naval force in the Pacific theater. Immersive single player gameplay: Diverse mission objectives and events combined with unique rewards make each campaign a new experience. Commandeer various U.S. submarines and progress your career as a naval officer via improved dynamic campaigns in Career Mode, or dive into 'instant actions' and single patrols for a quick fight. Addictive Online New Adversarial Mode: Join forces with up to 8 friends via LAN or 4 via internet in either cooperative or adversarial gameplay modes. Scripted and generated mission types allow for epic online battles and unlimited replayability. Scalable learning experience: Selectable difficulty levels allow players to choose how challenging of a simulation to play. Easy to control: An upgraded and streamlined interface makes moving around the submarine and controlling it much easier than ever before. German Campaign in the Indian Ocean: The new campaign spans from July 1943 until the end of the war for Germany in May 1945. Operate from such far-off Japanese naval bases as Penang, Singapore, Jakarta and Surabaya. Strategic Warfare: Rise in rank and experience, gaining access to new strategic resources, such as recon aircrafts that track down enemy shipping, and battle groups that can help wipe out superior enemy forces. New Playable Submarines: Take to the seas in new German submarines, including the long-range Type IX-D2 U-boat and the revolutionary Walther propulsion type XVIII U-boat. Learn the strengths and weaknesses of these boats and how you can overcome even elite, late-war allied destroyers with high-speed hit-and-run attacks. Heroes: Based on actual historical figures, these new crew members add a number of special abilities that can change the fate of battles and save the ship when the time is right, as well as adding historical color to the game. Better Accessibility: New and improved features such as intelligence information, navigation maps and upgrade systems ensure that U-Boat Missions will give players the expansion they've been waiting for. © 2007 Ubisoft Entertainment. All Rights Reserved. Silent Hunter, Silent Hunter 4: Wolves of the Pacific, Ubisoft, Ubi.com, and the Ubisoft logo are trademarks of Ubisoft Entertainment in the U.S. and/or other countries.. Video material furnished under license by and copyright © PeriscopeFilm.com and used with permission. Software platform logo TM and © IEMA 2006.